As a mental health carer I feel this is one of the most important things that can help build up a stronger relationship between a carer and whoever they help support, although I have not blogged in a while. I having been thinking about this issue and felt the need to post about it. Ever since the Time To Change campaign on tackling mental health stigma. I have realised how important it is to talk to your caree. I am sure many carers out there do this and try to spend time with who they support or care for, but I feel perhaps it might not be as widespread as I initially thought. I was at a Time To Talk event yesterday where we heard from Time To Change Champions. Now a Time To Change Champion is a sort of volunteer, but they also do talks, promote events and have gone through or are still going through the mental ill health. I found out several startling facts from the speakers who pointed out that many men under 45 are high on the list of taking their own lives. They almost stated that the south east of London has a very high rate of mental ill health cases, but what most took my attention is a lot of these points could be tackled by just talking about mental health issues. Working towards increasing the social capital of those suffering mental health stigma. Being honest with ourselves about our mental health. I am sure I could add more to the list above and some of these mentioned would need some funding, although I have seen so many volunteers working hard to raise awareness. It is also important to mention there are many other mental health and carer organisations working hard to break the stigma by not only talking, but also providing support. I guess what I am trying to say is we are all doing our bit, but there is always more work to be done. Living in London and realising that mental ill health is so high makes me wonder how many of us are honest about our own mental health. Perhaps it is good to be aware that mental health needs to be tackled, but the problem how we can do what we can in our own way. We need to lessen the rate of mental health problems in London and practically the UK, obviously more will need to be done and the problems of deprivation, social isolation and building stronger communities have to be addressed. Hearing that young men have a high rate of using the mental health system and also being 3 times more likely to take their own lives states that I should also be honest about my mental health as well as many men out there. We need to know that its ok to talk to someone and being vulnerable is not a weakness. I will point out though that society needs to do their bit as well, because I also feel many young men are not supported enough and many issues are swept under the carpet. As a carer its important to remind those we look after that we care for them. I know this is not going to be easy or even possible for many carers out there, but if we try it can make a lot of difference. The hardest thing I have noticed is that sometimes those suffering mental ill health may not have the capacity or energy to recognise friends and families trying to care. Mental ill health can easily destroy those precious relationships, it breaks bonds, isolates the sufferer and can turn people against each other. Carer’s, those with lived experience and health professionals can all play their part working together to strengthen the ties of support and recovery. A carer has to try talk to their caree and at the same time avoid labelling their loved one, we can all do our bit. A change just requires we keep talking. This entry was posted in Caring Hints & Tips and tagged caring, mental health, talking, Time to Change on February 28, 2015 by mmckenz11. As of this blog post. It is Time to Talk day over in the UK, which falls on the 5th of February. It has been a while since my last blog post and to be honest, I have been fairly busy with work and mental health involvement, but going back to the subject at hand. What is “Time To Talk” day all about? 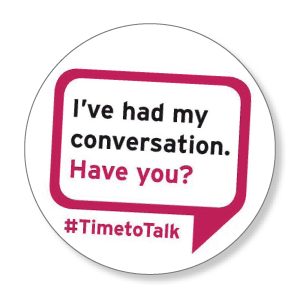 Time To Talk day focuses on the point that we should at least try to spend 5 minutes of that day talking to someone about our health, especially mental health. In fact I would go so far to state we should try to open up a bit more about ourselves, especially with a close friend or someone you trust. 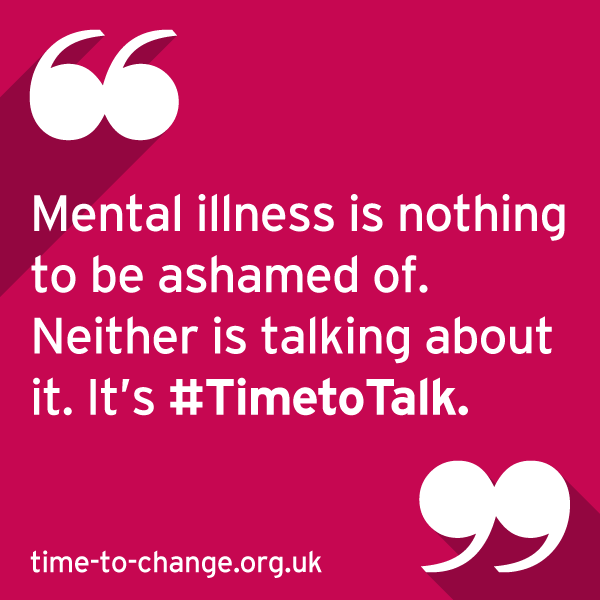 Time To Talk day is support by Time To Change, who are Led by Mind and Rethink Mental Illness which is England’s biggest programme to challenge mental health stigma and discrimination. You see the problem is mental health discrimination and stigma are still prevalent in today’s society. There are so many cases of people falling into mental ill health, because they do not get the support. Some who develop mental health problems might have stigma or shame about their symptoms and may often refuse to talk about it or refuse to seek help. For those who do not open up about what is bothering them, this situation can be risky because if they do not talk about their health or seek help, then its highly likely their mental health situation may get worse. There can be a large number of mental health cases that could be reduced if we all took the step to at least phone a friend. The emphasis need not be on the sufferer, but we as friends, helpers or carers can phone others who we are worried about. Unfortunately so many of us know deep down that someone is developing a mental health issue or are struggling. It could be stress, depression, compulsive disorder or many others mental health problems. The sad thing is that people often sit back and feel it is not their problem to check up on someone. Perhaps the person feels that they are being nosey or are imposing themselves on others. Maybe a lot of us do not have time to check up on others, but the situation is that if we do not check up on those who might be suffering in silence, then its quite likely someone may deteriorate in their mental health. It is so important to talk to others on what is worrying or brother in us, but also on the other hand it can be important to check up with our friends on how they are feeling. Its not like we have to say much, but at least listen to them. Being a carer myself of someone using the services, I know only too well what other carers may go through. Over the 12 years of caring, I have spoken and listened to so many carers in carers groups, networks, forums and events. I hear time and time again how carers have been isolated and brought to their wits end, because they had no one to turn to or no one acknowledge their situation. We carers need to step up and support not only ourselves, but each other. The thing is mental ill health does not discriminate, if you are a carer or support of someone who unfortunately has developed mental ill health, I am sure at times that you have been upset, depressed, anxious, worried and guilty. Taking these feelings to the next level, there is always a risk that carers themselves can develop mental health problems if not supported or listened to. To counter act such problems, its important carers talk to those who we trust about how we are coping. A carer does not always need someone to wave a magic wand to solve our problems. A carer can just have someone acknowledge what carers have or still are going through. So I hope that I have pointed out some of the reasons I think “Time To Talk” day is important. We need to push back on a society that feels that its good to be busy. As a society its good to take time out and spend it with a friend. It is good as a society we open up about mental health issues and combat the stigma and discrimination. As a society we need to change and there is no better time than to do this now. Its Time to change!! Its Time to Talk. Happy Time to Talk Day. This entry was posted in Event reviews and tagged caring, depression, mental health, Time to Change, time to talk, time to talk day on February 5, 2015 by mmckenz11. Welcome to another mental health event review. I have not blogged for quite some time off my carer’s blog, although I did do a video blog last week, which will be shown off this blog. One of the other blogs I contribute to being slamtwigops has been suspended during a transition stage, but as for myself I like doing blogs and I am fairly passionate about mental health or the how carers can contribute in the well-being of others, so I thought to continue blogging off my site. 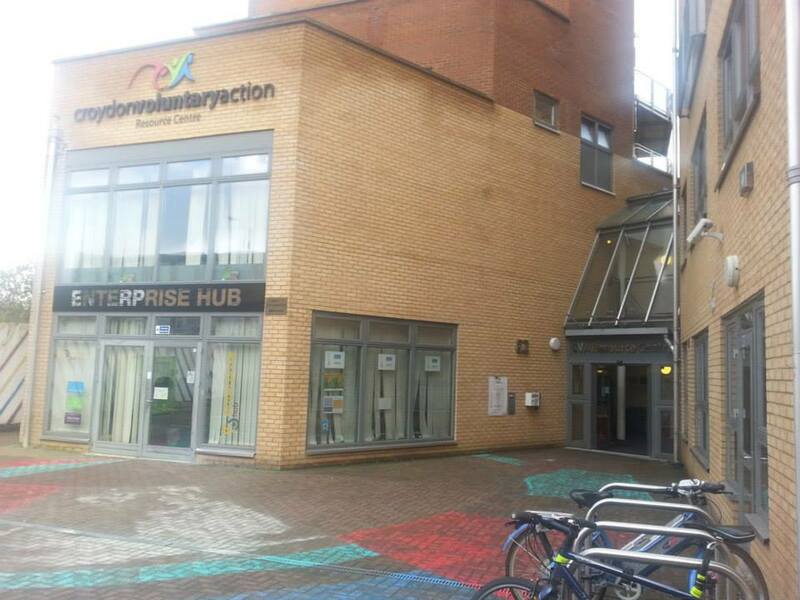 On the 12th August 6 pm 2014 I decided to pop over to the Croydon Voluntary Action building which is situated over in the London borough of Croydon. 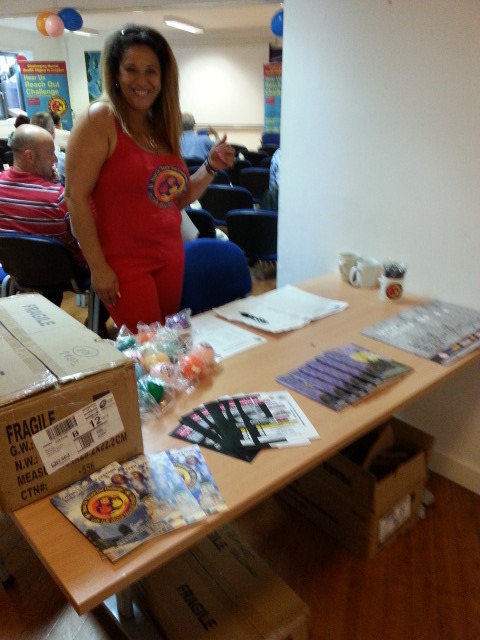 There was a special celebratory event taking place, which celebrated the 18 months of their anti-stigma project. This project was run by “Hear Us Reachout Challenge“. Hear Us is Croydon’s Mental Health Service User Group which acts as a coordinating body to facilitate, and ensure service users involvement in, the planning, delivery and monitoring of mental health services in Croydon. Helping to improve the quality of the services commissioned and delivered in Croydon objectives. 1.To relieve the needs of people living in the London Borough of Croydon and surrounding areas who have mental health problems by provision of services and advice. 2.To advance education about mental health for the public benefit in the London borough of Croydon and surrounding areas with the object of creating awareness and reducing the stigma attached to mental health. Going back to reviewing the event, usually when I arrive to events or forums run by “Hear Us” it can sometimes take a little while to get in, but this time I got into the room quite easily. The staff was very friendly and I was given a run down of what to expect at the event. I noticed a lot of booklets and reading material about the project and I spent some time reading the Bio’s of the volunteers and contributes who work for “Hear US”. 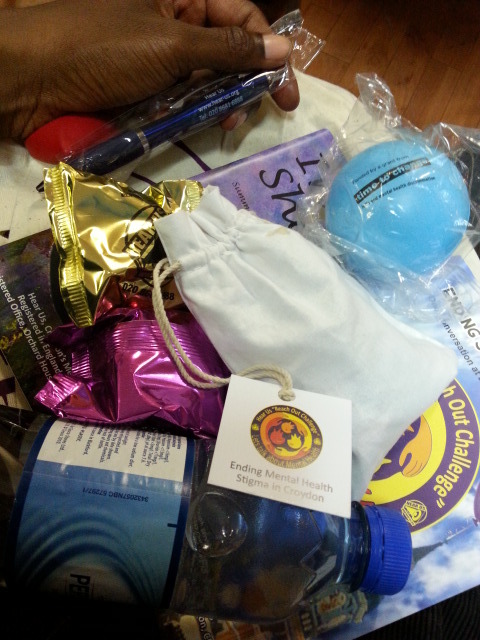 When I sat down to set up my equipment, I was delighted to see that there was a goody bag filled with lots of treats and more information about the event, project and mental health resource information. There was also some sweets, fortune cookies, stress ball and pen, plus water and lots more. 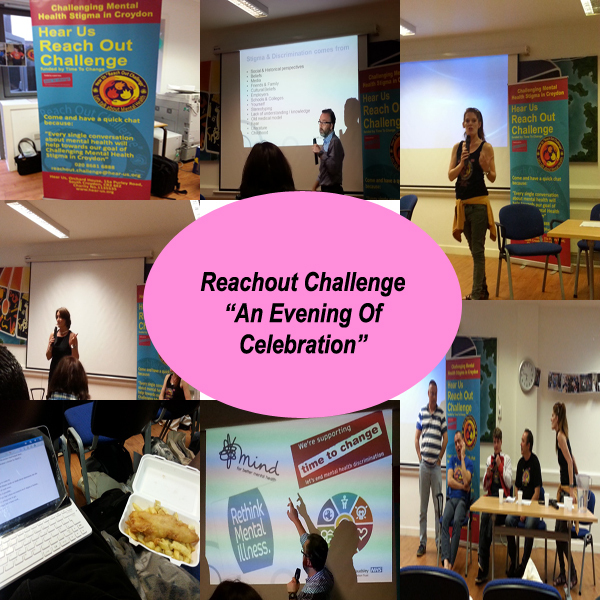 This showed how much effort “Hear Us – Reachout Challenge” had taken to provide information and make the event as welcoming as possible. While we were waiting for the event to start, the audience was treated to some music playing off the speakers, one of the songs was “I am still standing” by Elton John, which I thought was rather fitting. We were shown lots of slide show pictures of what “Hear Us” has been up to over the past 18 month’s since 2014. 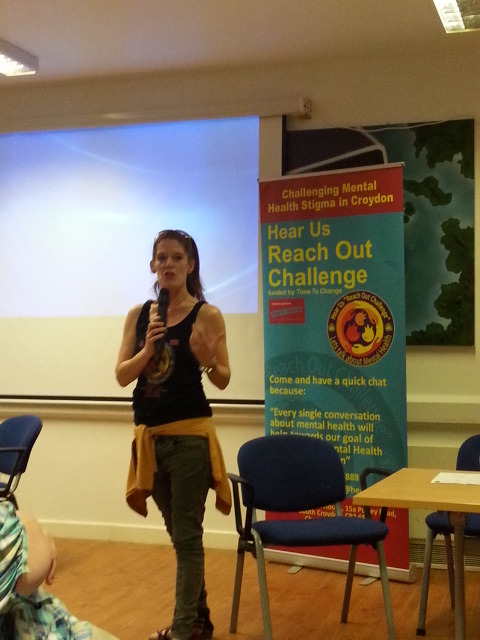 After some slides, we then had the Project Manager Jane White speak about “Reach out challenge” and how they were funded by “Time to change“, plus how “Hear Us – Reach out Challenge” were set up to challenge mental health stigma, especially in the London Borough of Croydon. A lot was talking place that day and next up after Jane White spoke about the project, we then had Dr Ray Chapman speak on “Stigma & Discrimination”. Plus Ray then Talked about “positive impact needed from mental health professionals”. 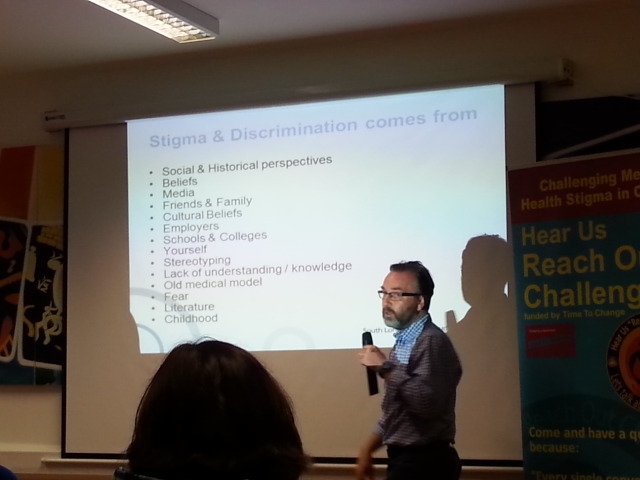 Dr Ray felt things needed to be done things differently and felt Working with partners was key to tackling mental health stigma and discrimination. I have also done a video blog of the event, which talks a bit more on Ray’s presentation as a review which you can watch below. After Dr Ray’s presentation, we then had Jane talk more about the volunteers that helped Reach Out Challenge and Visa-Versa. Hearing from the volunteers was perhaps one of my favorite part of the event, because I am quite interested in people’s lives and their experiences. Some of the stories told by the volunteers were very personal and challenging to listen to because of how much each had went through, but I felt I learnt quite a lot from their stories. 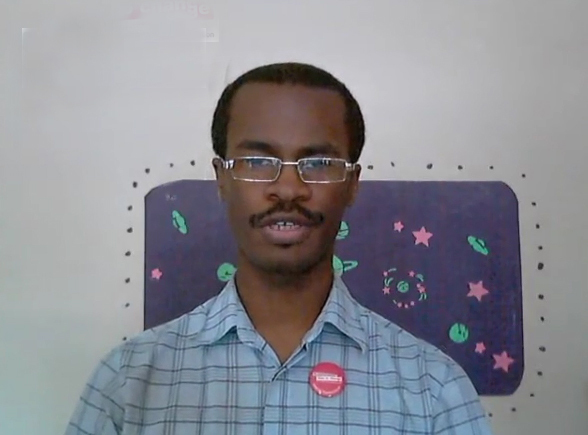 The learning aspect is good in order to challenge my own prejudices. 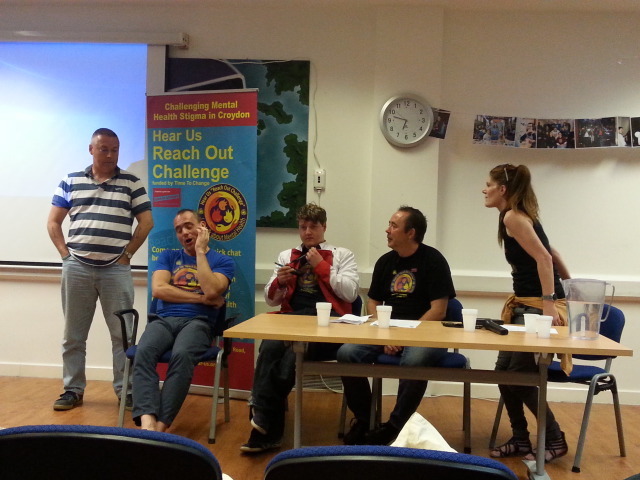 The Volunteers spoke about how mental health has affected them. – How certain things they tried to cope with mental health did not always work in the past. – The reasons they got involved in the project. – Challenging stigma and how its still out there. – How some lost a lot of opportunities and support once mental health difficulties first hit them, but felt a lot about the project had helped them. After hearing the volunteers speak, Jane white spoke a bit more on the difficulties the project had faced. She was worried and pondering how to work with organisations in order to get rid of mental health stigma. 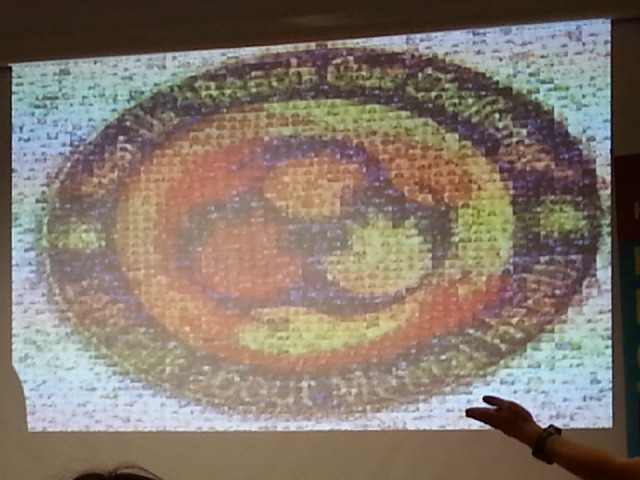 We where shown more slides and I was impressed with a slide containing a 1000 photos forming a logo of “Reach out Challenge”. Over the 18 months, The project has worked with 17 organisations. 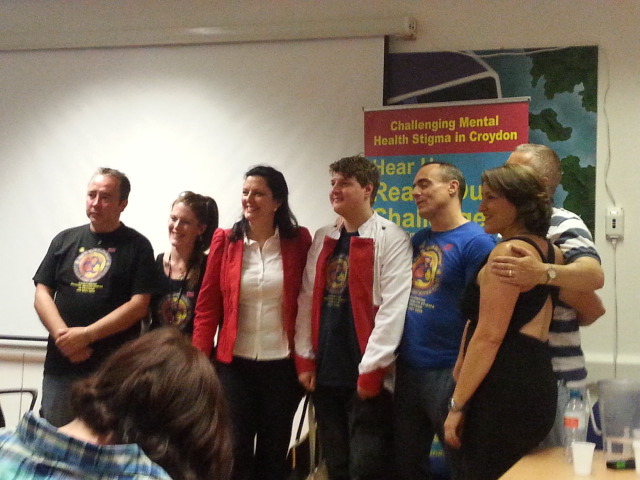 They also Produced positive stories in mental health and have produced many positive changes tackling mental health stigma in Croydon and helping to give those with lived experiences a voice. It is so important those who use mental health services be given the confidence to speak up about what they have gone through, but its also important that they are heard, thus the name of the project “Hear Us”. This is perhaps the same for carers as well. Over the 18 months the project members tested How useful the project has been, so we were shown graphs produced on the slides. Jane White reminded us to Sign a pledge with “Time to Change” so we can challenge ourselves for the better helping to combat and reduce mental health stigma. 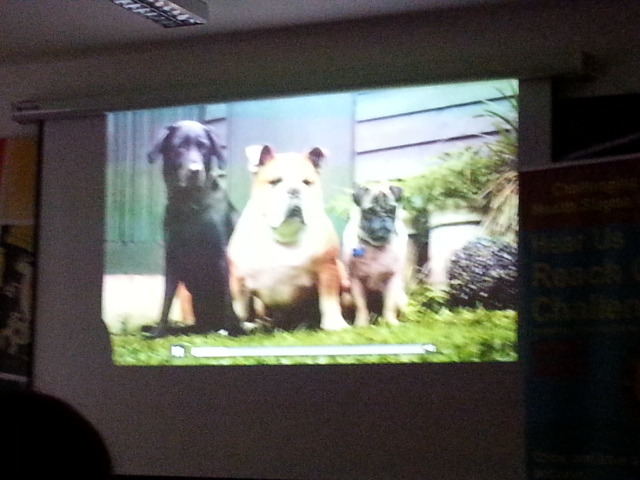 Next we were shown the latest “Time To Change” campaign which is the #wolfpack video, #wolfpack probably being the hashtag on twitter. I could not stay for long because I had to rush back in order to look after my mother, but before I left. 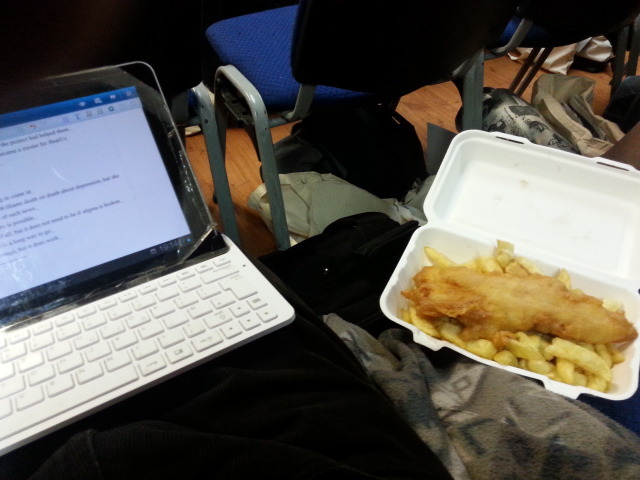 I ate some Fish and Chips provided by “Hear Us – Reach Out Challenge”. 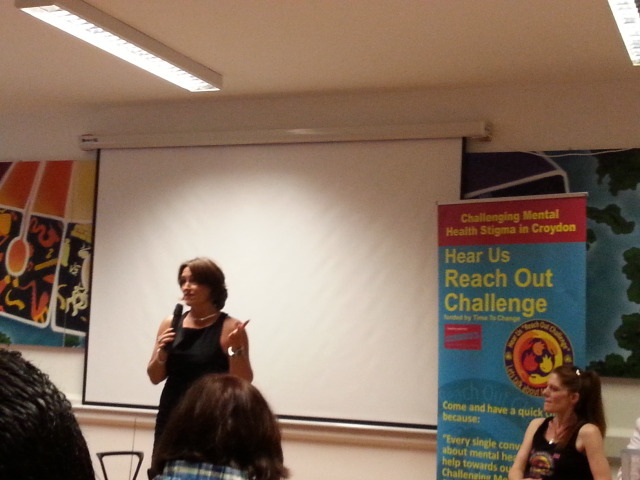 Eventually Sue Baker who is the Director of Time to Change arrived to speak to us at the event. Sue Thanked HearUs for all their work and she spoke about how change is becoming to take effect. She talked about the day due to Robin Williams death on death about depression, but she feels the media is a lot more supportive of such news, because in the past there would be some ridicule and stigma coming from the media. She feels help is possible, recovery is possible, but depression is the biggest thief of all, but it does not need to be if stigma is broken. Change is happening, but there is a long way to go, but having conversations can be tough, but it does work. Overall I enjoyed attending and blogging about the event, as a carer I still feel I hold a lot of prejudices about mental health and sometimes I lack the patience to understand those using mental health services. I hope such events provided by HearUs can help me challenge those prejudices as soon as possible. This entry was posted in Event reviews and tagged mental health, reachout challenge, Time to Change on August 22, 2014 by mmckenz11.